Notification with the passing of retired Delta pilot Captain George Lee Jones, age 80. 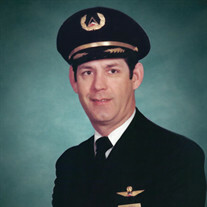 Captain Jones joined Delta Air Lines 01-03-1966 and retired in 1998, based 031/ATL. He is survived by his wife Jo Ann, their children and grandchildren. 5092 Charlemagne Way SW , Lilburn GA 30047-5454. George Lee Jones, age 80, of Lilburn, Georgia, went to be with his Lord and Savior, surrounded by family on Friday, May 25, 2018. George was preceded in death by his father, Thurman Luther Jones and mother, Hazel Elliott Jones. George is survived by his beloved wife, Jo Ann Gentry Jones, children and their spouses, Leeann Jones Jannett and Keith Richard Jannett, George Luther Jones and Kelley Ryder Jones, Timothy Elliott Jones and Jennifer Langley Jones, Catherine Jones Singleton and Justin Brett Singleton; grandchildren, Madison Rose Jannett, Kylee Grace Jannett, Noah Matthew Jannett, Emily Ann Jones, and Lainey Hazel Jones. George was born and raised in Canton, North Carolina. He is a graduate of Canton High School, and after graduation, he worked at the local papermill while putting himself through flight school. George followed his passion and became a pilot for Delta Air Lines and traveled the world as an international captain for 33 years. After retirement at 60, George turned his love of fishing into a 20 year career in the fishing department at Bass Pro Shops. George was one of the founding members of Stone Mountain Community Church in Stone Mountain, Georgia which later became Cornerstone Bible Church in Lilburn. He followed God’s calling for spreading the gospel through Bible translation to the unreached people groups of the Philippines. In his free time, he enjoyed spending time with his family, fishing, and coaching and mentoring through youth athletics. The funeral service to honor and celebrate the life of George Lee Jones will be held on Wednesday, May 30, 2018 at 11:00 AM at Cornerstone Bible Church, 869 Cole Dr, SW, Lilburn, GA 30047. Interment will follow at Eternal Hills Memory Gardens, Snellville, GA. The family will receive friends on Tuesday, May 29, 2018 from 6:00 PM until 8:00 PM at Tom M. Wages Snellville Chapel and Wednesday, May 30, 2018 from 10:00 AM until the time of service at the church. In lieu of flowers memorial donations may be made to JAARS, Waxhaw, NC, www.JAARS.org . Tom M. Wages Funeral Service, LLC, A Family Company, 3705 Highway 78 West, Snellville, GA 30039 (770-979-3200) has been entrusted with the arrangements.